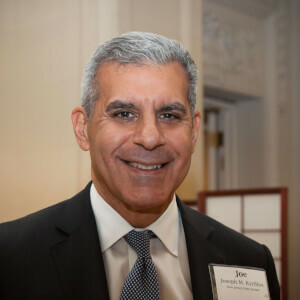 WEST LONG BRANCH, N.J. (Dec. 3, 2018)— On Friday, Nov. 30 former state Sen. Joseph M. Kyrillos hosted “Bridging the Partisan Divide,” the second of four panel discussions he will lead as the 2018-2019 Monmouth University Public Servant-in-Residence. 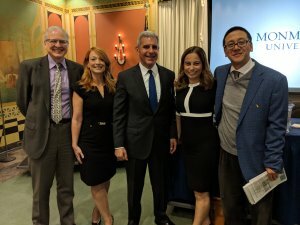 The panel featured experts from across the political spectrum, including Julie Roginsky, Democratic Party strategist; Jeanette Hoffman, Republican Party strategist; David Chen, investigative reporter at The New York Times; and Patrick Murray, director of the Monmouth University Polling Institute. “When we develop habits of sacrificing the long-term good of the people and our institutions for the short-term advantage of party; when we think we have nothing to learn or gain from talking with the other side; when we won’t agree to fair and reasonable compromise that we know are for the public good because we want to keep a winning political issue alive for the next election: that is what I call excessive partisanship,” said Kyrillos. 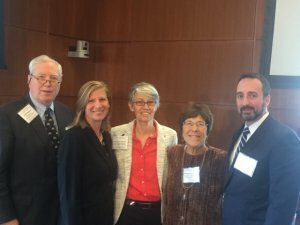 Panelists noted that gerrymandering, social media, and traditional media have all contributed to stoking the partisan divide. More competitive races for elected office, increased face-to-face interactions, and civic education were identified as potential solutions. 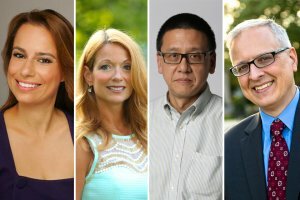 Despite finite resources, Chen said that journalists should try to “get back to the basics” and spend more time on the ground meeting people and hearing their stories.